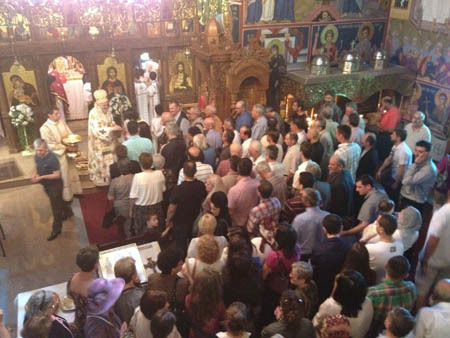 Milton, Ontario - Over three thousand Serbs gathered at Holy Transfiguration Monastery in Milton on Sunday, June 10 for the Diocesan Day celebration, the largest of our faithful in Canada. This monastic gathering began prayerfully, with the Holy Hierarchical Divine Liturgy at the monastery church. His Grace Bishop Georgije of Canada officiated at the liturgy with the concelebration of all the clergy from Ontario and Quebec. The diocesan choir “Kir Stefan Srbin” from Toronto sang the responses. Following the liturgy, a great number of faithful flooded the monastery grounds. Thirteen folklore groups were the central focus of the program in the pavilion. The program was organized and planned by choreographer Mile Peric from Waterloo. The Kitchener girls group “Kosovski bozuri” was also taken note of. The large number of children and youth, not only the ones that participated in the program, were the dominant focus of this year's Diocesan days. There are more and more younger parents with their children that come to these church gatherings and slowly become a part of the church life and activities in the Diocese. For this reason do we rejoice that a large portion of this year's celebration was dedicated to the youth. The little ones enjoyed being driven around the monastery the most. The “Kosava Band” entertained the people in the later afternoon and evening hours. The beautiful and sunny day brought good attendance and mood. The organization of the Diocesan days, in which all the neighboring parishes take part, was impeccable. We thank all volunteers for their added effort. The Diocesan days are celebrated on the weekend of All Saints Sunday (the Sunday after Pentecost). On the first day the Serbian schools and Church school comes together. This year's Saturday gathering, despite the bad weather, saw ten schools participating.